Marquette Golden Eagles guard Markus Howard has been selected Big East Player of the Week on Monday. Howard helped Marquette to a 2-0 week which included a win over No. 12 Kansas State on Saturday. 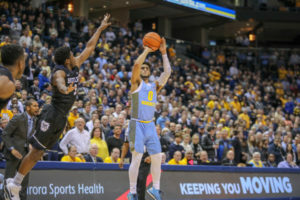 He scored 45 points, the second highest single-game point total in Marquette history, in an 83-71 win over the Wild Cats. Howard shot 11-of-17 from the field and 19-of-21 from the free throw line. Howard also scored a team-high 17 points in a 76-55 win over Charleston Southern. For the two games, he averaged 31.0 points and 4.5 rebounds. For the week, the junior averaged 31.0 points while shooting 51.5 percent from the floor and 90.5 percent from the foul line.